Happy Monday! It's time to link up your meat free posts again! Wooo! It's also the debut of our new Planetbox Shuttle! I finally broke down and bought one :P It's the perfect size for Kidlet and I just couldn't resist any longer. Such an attractive lunch! 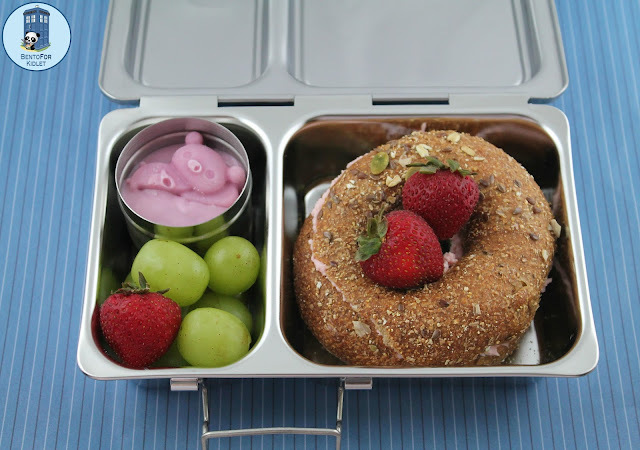 I love how the strawberries look in the bagel! Also, thanks for hosting this Jenn. Ooh, love the lunch! Thanks for the linky! What a perfect bento for such a cute little box! Love it! I love how pretty and simple this lunch is! I just used an ice pack :) But freezing would work too!